Holdem and its variants always take the cake when it comes to poker. Even people who know zilch about poker have faintly heard ‘holdem’ in some manner or the other. 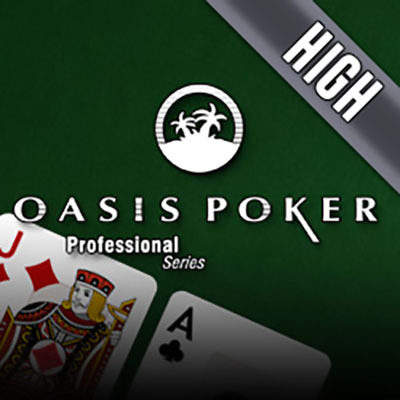 Despite holdem poker’s popularity, we strongly believe that there are other versions of poker that are just as good, case in point: Oasis Poker Pro High. This online poker game allows you to place a bet of as high as £500 and frees you from having to dip into those cheeky poker tactics which at times reduce the game to ‘who is the better bluffer.’ The game is strictly about the cards dealt, and the strategy that follows. Think of Oasis Poker Pro High as Pokerface without the ‘face’, as Lady Gaga without her gaudy appearance, and the music – unplugged. It essentially is the same game but back to basics. It is a great game for players who love poker but could do with it toned down a few notches. The process of the game is the same as holdem. Starting with 2 Hole Cards which are cards that are dealt face down (they are not displayed for everyone to see). This is then followed by a round of betting. After which, it is time for The Flop which is when 3 cards are placed in the middle of the table, face-up. These cards are communal. After The Flop, a 4th card (The Turn) is placed face up on the face, which is then followed by the final card (The River). Below are the card combinations you need to get in order to win. Oasis Poker Pro High is an easygoing poker game that can prove to be very rewarding if played right. It allows players to focus only on the cards and strategies, which is a great alternative to the usual elements involved in playing conventional poker. This is game is perfect for high rollers.